My mom used to always set up Christmas crafts for us to do. I’ve made ornaments from the tin off of coffee cans and butter tub lids. We used to make snowmen out of paper plates and cotton balls. My mom always had something for us kids to do. Making some ornaments for my tree this year brought back a lot of memories. I made quite a few different styles and I thought today I’d share a few of them with you. I could not find any “stock” red and green ornaments free of glitter so I decided to make my own. I also saw some cute white ones with things on them on Pinterest that I wanted to give a try. First remove the loop for the hook and the cover. Pour some paint into the ornament then turn it or shake it to fully cover the ornament. After 1 or 2 you will find what works best for you. I did a mixture of both. You may need to add more paint to get full coverage. After you have completely covered the inside of the ornament place it upside down in an egg carton or the packaging it came in to drain out the excess paint. Then, once most of the extra paint is drained out, place the ornaments in an upright position over night to dry. You may want to leave them a little longer. Mine took a little long to dry than expected. Now put the hook loop and cover back on the ornaments. Now you can put on an ornament hook and place them on the tree, like I did with the red and green or you can decorate the outside. You can decorate however you like. I’m just doing a simple ribbon but you could apply glue and red glitter and make a candy cane or Santa or whatever you’d like but I’m not one for glitter so I’m sticking to ribbon. To sick on the ribbon I just measured it to size and glued it were I wanted. I was going to write words on the rest but I couldn’t find a writing brush. I could have sworn I’d had one but I couldn’t find it when I went to paint them last night. I’ll have to save that for next year. I went a little overboard with these and made a ton of them. They aren’t exactly like the ones you see on Pinterest. I could not find loose scrabble tiles at any store. They sell them on Amazon but I didn’t know if they’d get here in time. The closest I found were these alphabet tiles at Michael’s which I didn’t end up using the original part of anyway. I bought 2 packs and still didn’t have a W for Let It Snow. I wrote one with a sharpie but it bled so I just decided to stamp the back and then I could write anything I wanted. First I laid out all my tiles and started planning what words I wanted to make. A little while later I decided to stamp them. If you want to stamp them make the words you’d like them lay them out in front of you. One word at a time, turn over the tiles and cut the popsicle sticks so that they touch every tile but don’t hang over the edge. Then glue them down in the middle. Once they have dried glue on the ribbon in the style you’d like. I did a few were one end of the ribbon is on each side and a few others were the ribbon met in the middle. After the glue dries they ready to hang on the tree. I only did one of these because I hate glitter and I could only get one tree to fit though the hole in the top. I thought they were small enough to fit but the fake snow on the trees make them really hard. I got one in and I was done. Take off the top of the one of the ornaments it’s time to add the glitter. I made a funnel from a piece of paper and then poured it in. I did this in a plastic bag. Even though most went into the ornaments it is glitter so it would still go everywhere. After I got the “snow” in I pop a tree in pop on the top, added a white ribbon instead of an ornament hook. And it’s ready for the tree. I loved the idea of a jingle bell ornament but no one sells them. Well Hallmark sells a Polar Express one but it is $30! So since a bag of them is $5 and ribbon is $0.50 I decided to make some. This one is the easiest of the bunch. Cut the ribbon double the length you want they ornament to hang. Cut it at an angle if you want get fancy. String the ribbon thought the loop on top of the bell and tie it. And you’re done! I hope you guys enjoyed these DIY ornaments. This is my first DIYs posts so I hope I explained well. If you have any questions about any of the ornaments leave it in the comments below and I reply as soon as possible. I’ll be doing another Christmas DIY for my next day of blogmas so stay tuned for that. You can find previous days of Blogmas here. I’ve done a couple cute Christmas tags. And if you guys love Christmas DIYs you should check out my sister’s YouTube Channel. She is doing 25 days of Christmas DIYs. 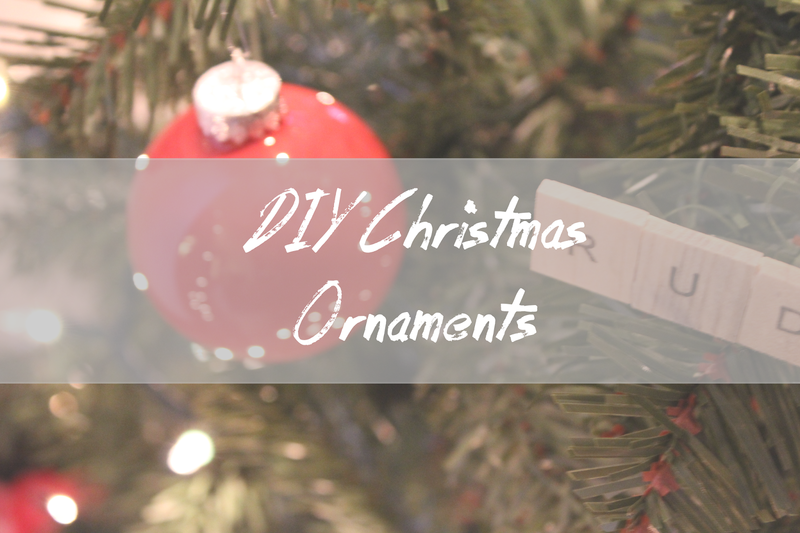 In the comments below I’d love to know what DIYs you’re doing this Christmas season! Please leave a like if you enjoyed this post and if you have any questions or concerns feel free to message me. Photo Credit: all photos taken by me with a Canon T5 with a 18-55mm lens.